I enjoyed attending a Midwestern Bio-Ag field day. Fertilizer is their main business, but they also deal in feed and seed. 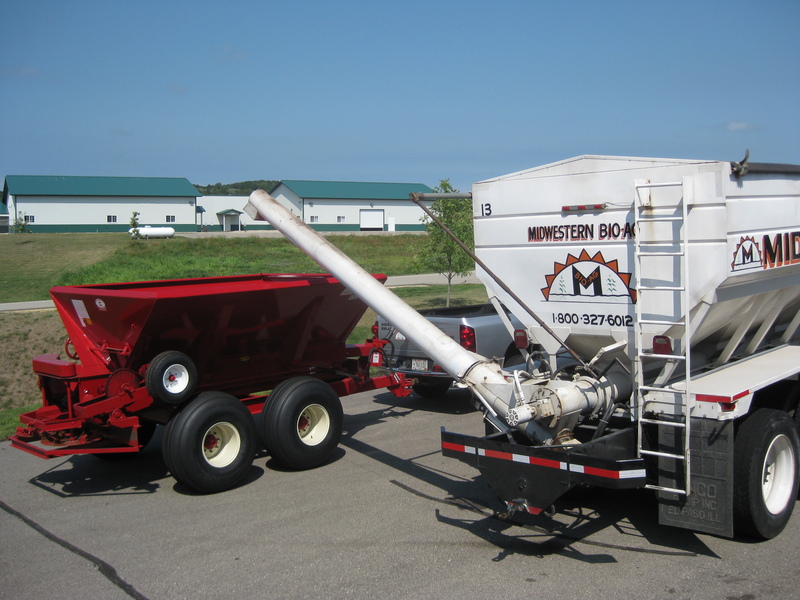 Pictured is a large truck which is used to spread fertilizer, and a red buggy which a farmer can pull behind a tractor to spread fertilizer. I always listen to a person who admits he doesn’t know everything. I have a difficult time knowing if a fertilizer is real, or “foo-foo dust”. There are so many variables in farming, it’s nearly impossible to know if a little something we spread on the fields has an effect. Unless I correct a visible deficiency, fertilizer is almost faith-based. That being said, I’m thinking about working with Midwestern Bio-Ag for my fertilizer wants and needs. I plan to figure ways to test the effectiveness of their products. This entry was posted on Thursday, September 1st, 2011 at 12:06 am and is filed under Curious crops, Curious farmer, Curious fertilizer. You can follow any responses to this entry through the RSS 2.0 feed. You can leave a response, or trackback from your own site. How will you test its effectiveness? Apply fertilizers with some control areas which don’t receive any. Soil tests before and after. Feed tests before and after. Anything else which seems practical. Be careful when you are dealing with them. My brother-in-law is dealing with them and they tested his farm and suggested fertilizers and my yields are the same as his without all the micronutrients they suggest he spread. Just remember they are in the business of selling product and with crop and animal prices the way they are everyone is looking to get their share of the farm income. Picking the right varieties of seed, getting it in the ground at the right time and catching the right weather are sometimes more important than putting on a certain kind of fertilizer. Good point, John. The farmer’s management is always going to be more important than a certain kind of fertilizer. This is why I want to include some test strips which don’t receive the fertilizer. Try to isolate one variable, while keeping everything else the same. Otherwise, how would you ever know? Mr. Zimmer does have a different attitude about fertilizer. Namely his emphasis on calcium, over the usual NPK. His new book gave me some different things to think about, and I would loan it to you if you like. Having read the book as well, I believe that the message of going beyond NPK is the take home point. We all know NPK can grow plants, but from basic biology class, one can read that plants require 20 or more elements. If you continue to take off those elements/nutrients, year after year, it is important to put them back. Otherwise you are robbing Peter (your soil) to pay Paul (i.e. farmer). 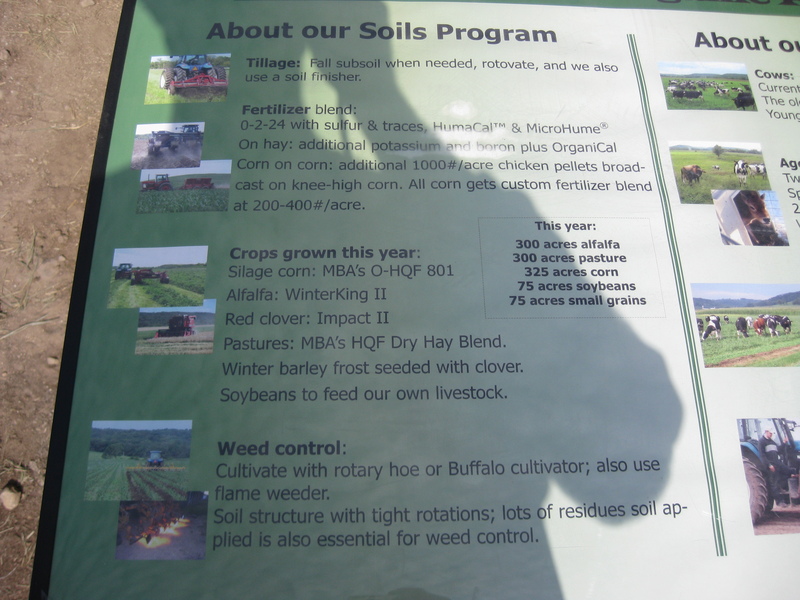 The book also explains the importance of soil biology and how important that is to soil and crop health. I would be more opt to have skepticism about a fertilizer company that doesn’t address the full spectrum of nutrients and only concentrates on NPK. It will be great to see what results curious farmer receives on his test plots. In the biological farming method, you may or may not see dramatic changes in one year. On our farm, it took over one year to see any drastic changes because of how our soil had been managed over the years. To compare biological farming to losing weight, people don’t shed 50 or even 20 pounds in the first month & keep it off & maintained for a long time, nor does your farm change it’s soils in just one year. Soils need management and time and the right biological needs to change. It’s a slow process and also a quick process. Everyone wants results now. I know of farmers that are getting higher yields being biological & organic/non-organic than those that are conventional & non-organic. One farmer I met after being on the biological system for so many years is now in what I see as the maintenance phase, he only applies what fertilizer he needs and manure. His yields and resistance to insects and disease are amazing. In my opinion if you want to see results now stay where you are, if you want to grow to where your crops see amazing results in 2-5 years try biological.